(Spanish Test) Know your level of Spanish. Now you can make it. Practices with our online exams your level of Spanish... READ MORE. 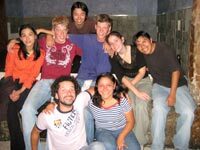 (HOSTAL GALAPAGOS) Private room + I take a bath private, kitchen facilities, Area social TV, stereo, telephone USD 10,.00 per day. 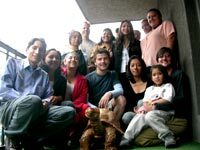 Also ccommodation at our budget furnished apartment, Shared apartments or homestay with local hospitable families in Quito. We make..... READ MORE. (OUR TOURS) Once per week we organize activities without additional cost outside of the school. We visit interesting museums, indigenous markets..... READ MORE. (Son Latino) Enjoy and have a good time learning how to dance Latin rhythms like Salsa, Merengue. one on one or grups Classes, flexible schedules. Accommodations at Galápagos Hostal, located very near to the School: single, double or triple rooms shared bathroom, completely fumished, phone, Tv, Stereo. 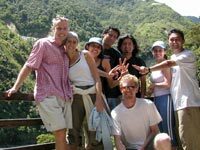 Spanish lessons (mini group) and accommodation with local hospitable family. Near to the school (two to twenty minutes walking) (private bed and bathroom + two meals per day, and laundry service). 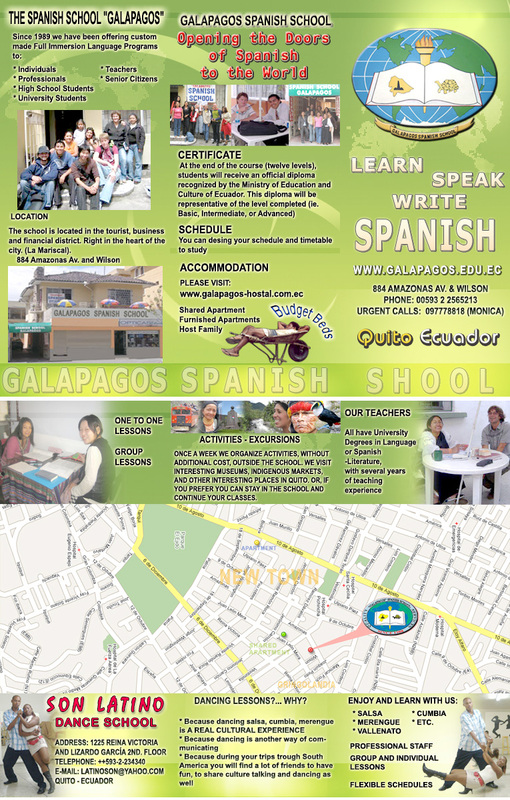 20 individual Spanish lessons and one daily excursion in the city. You will see the largest and best preserved historic Centre in Latin America. El Centro (the Historical Centre) is the home to many inspiring museums, traditional shops, churches and picturesque plazas, such as Plaza de la Independencia, The Cathedral, City Hall and Government Palace, La Compañìa de Jesùs Church, Plaza de San Francisco, La Ronda ( one of the city`s most iconic streets. El Panecillo viewpoint, La Mariscal , The Equator Line, Museo Intiñan, La Casa de la Cultura Ecuatoriana, etc.etc. Activities outside the school are conducted by our experienced staff and teachers. (Not included , expenses outside of the school). Of course you can combine the programs as you prefer. As part of our family philosophy it is natural that we will help you in whatever way we can. The school has built up contacts to best suit your needs. Help with visa related problems. 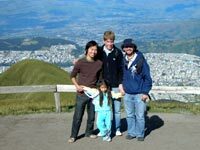 Upon arrival to Ecuador, transportation from the airport to the school or to the place where the student will lodge. Be sure to include your name, date and time of your arrival, airline and flight number. Easy transfer company will wait for you any time. Your safety and comfort are a priority for us.